Many people hate dress codes, mostly because dress codes are restrictive, it hampers their style, flair and creativity. It prevents hipsters from being hip. I get it, I mean, you’re talking to the guy who didn’t wear a shirt to work. My second (real) job suited my teen inclinations perfectly – every day my work attire consisted of a lavalava (wraparound Polynesian sarong). That’s it! No shoes, no shirt, plenty of service to our visitors at the Polynesian Cultural Center. My attire (or lack thereof) presented an opportunity for me to teach visitors to the PCC about our unique Polynesian cultures while simultaneously saving me on laundry charges while I worked on my tan under the Hawaii sun. Certainly when tourists visit the PCC, they don’t want their experience and exposure to the native cultures of Polynesia to be introduced to them by a guy wearing a suit, bow tie and a pair of Oxfords…right? My very first (real) job was also at the PCC – I worked as a food runner, stocking the buffet line at the Gateway Restaurant. That job required that I wear sensible shoes with good traction, a pair of black slacks and an aloha print, button down shirt. We also wore food service gloves and hair nets. It was my daily uniform. It was inhibiting, hideous and after a long night of bussing tables and running around with pans of food, my clothes were drenched in perspiration but it was necessary because no one wanted to be served food by a kid with sweaty, bare tanned skin…or do they? Same company; two very different settings; two very distinct dress codes for very specific and practical reasons. Throughout my professional career I have worked in companies where employees were subject to dress codes outlined by their management teams. In many cases the dress code was catered towards and conducive to the work environment and setting. Often these were very specific and periodically, the dress code was re-evaluated to reflect the times or to address a troubling trend that the company felt did not reflect the company culture. Many people hate dress codes, mostly because dress codes are restrictive, it hampers their style, flair and creativity. It prevents hipsters from being hip. I get it, I mean, you’re talking to the guy who didn’t wear a shirt to work. But I’m of the opinion that dress codes are necessary, particularly in a professional environment where consumers are expecting certain behaviors from an establishment. Sylvia Stoel is one of those people – she hates dress codes. As an employee of JCPenney, she was asked to go home and change because the shorts she was wearing did not conform to the companies dress policy, not because they were too revealing as many media outlets have reported. Stoel left that day and never returned. She said that she was fed up with dress codes that targeted women and that she was never told during orientation that shorts are not allowed. 1) JCPenney probably did not do enough to ensure that their employee’s, specifically new hires like Stoel, are aware of the dress code. 2) Stoel should have done more to educate herself about the dress code. 3) Because Stoel did not agree with the dress code, she did the right thing for her – she left the company. 4) Stoel wanted the world to know that she disagreed with the dress code because she took to social media to air her disapproval. 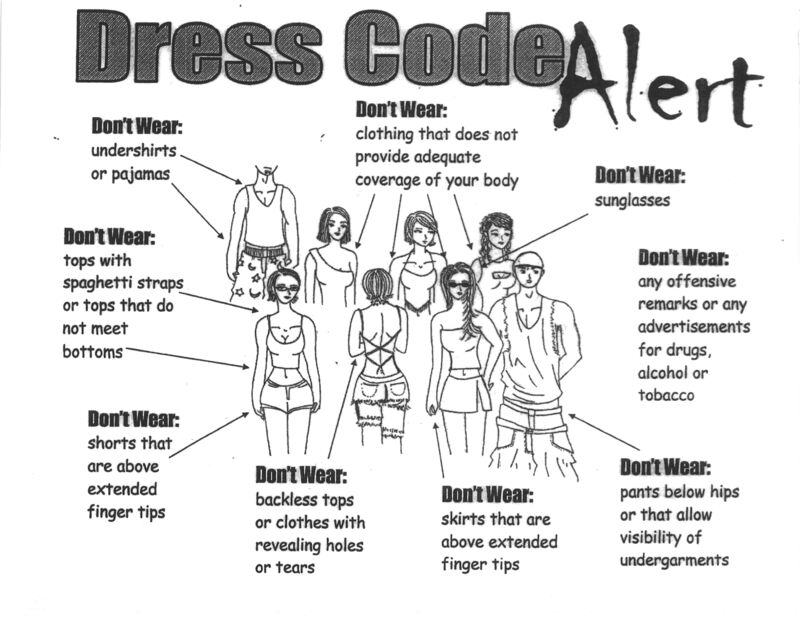 Whether we agree or disagree with dress codes, the truth is they will never go out of fashion – pun intended. Dress codes are in place, not to inhibit a companies employee’s but rather to enhance their workplace, cater to the needs of their customers, create and foster a company culture and in many instances, a dress code is in place for the safety and well-being of its clients and customers. My advice to those like Stoel who are new to the workplace is this: if you want to wear shorts to work than you need to look at companies and work environments that allow shorts in the workplace. I worked for a very radical start up software company whose CEO allowed shorts because that’s all he wore, even in the winter. The employee’s loved it. I also worked for a software company where we were required to wear a button-down dress shirt and dress slacks but the CEO, a California surf nut, would often comment in company meetings that he wished we could wear shorts every day, but because we had regular visits to our office from current and potential clients, it was important to maintain a professional working environment. If it makes any difference, I have my own reservations when it comes to dress codes but I understand the business logic that drives these policies. If there ever comes a time when I have to don a shirt and tie again, I may be looking for job opportunities at PPC all over again. Next Next post: Who ordered the screaming baby?